One New Aftermarket Replacement Exhaust Manifold (with Gaskets) that fits John Deere Early Model B (Up to Serial # 200999 with use of # JDS372 Exhaust Pipe) -- Note that the "Late" B Models started with Serial # 2010000. NOTE: The Exhaust Flange Bolt Holes are at an angle. Part Number (1 of each) -- B2472R (Manifold), JDS073GK (Gaskets). Only the 48 contiguous States in the U. 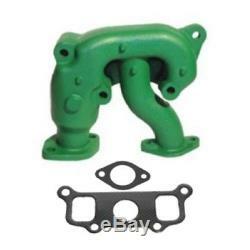 The item "B2472R Manifold for John Deere Model Early B with Gaskets" is in sale since Friday, October 14, 2011.